People have returned to the Old Spaghetti Factory time and time again to enjoy our great food in unique surroundings since 1970. All our meals are carefully prepared, and made fresh daily on the premises using only quality ingredients. We pride ourselves by offering great food at reasonable prices. All our entrees come complete with a crisp green salad, sourdough bread, coffee or tea, and spumoni ice cream at no additional charge. 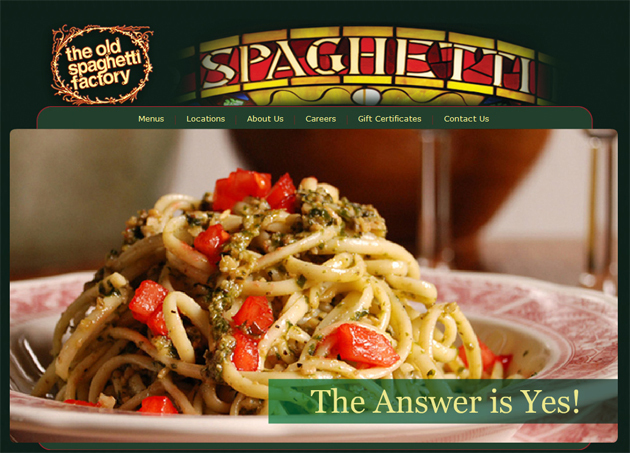 Without a doubt, The Old Spaghetti Factory is the best dining value anywhere.